Sand. Swathes of sand is all you can see now. It is called Aralkum or Aral Sand. Each day, this 4m hectares of artificial salt sand mercilessly throws out 75-80m tons of Aralkum through sand storms. For many, fish is their daily bread. Take that away and you take away their livelihood. 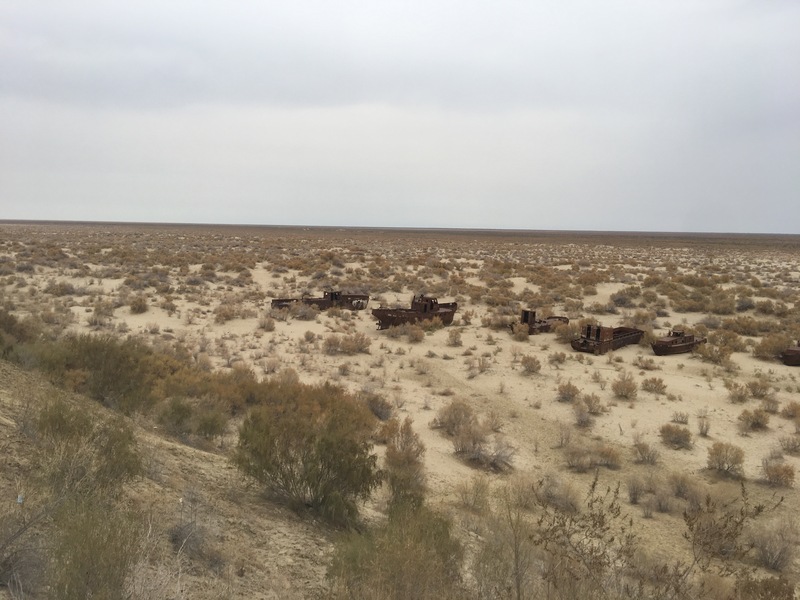 That was what happened to the people living in Moynaq, the town that was once at the edge of Aral Sea. For a landlocked country like Uzbekistan, imagine coming to a place to see water, a flock of flamingoes, dipping your feet in the water, picnicking on the shore. Imagine the stories the captain of the boats would have told his children about his day out at sea. Imagine the pride of catching a big fish and bringing it home to his family. Fishing was the main industry in Moynaq. It attracted a number of migratory birds and would have been a haven for all those living close to the water. Even from high up where the car pulls into the driveway, you can’t see water at all; it has receded as far back as 150km. 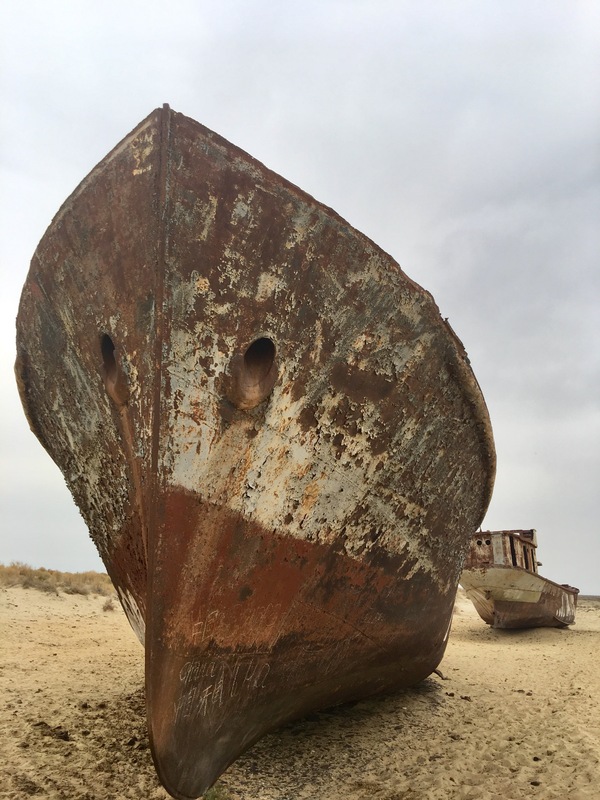 More water is in Kazakhstan side, leaving Uzbekistan a cemetery of ships and a vast, unirrigable land that serves as a constant reminder of what environmental disasters can mean for the everyday people whose lives depend on it. Approaching the “cemetery of ships” is a surreal experience, almost eerie. To add to the atmosphere, you are surrounded by deathly silence, like a graveyard, except it is a grieveyard because the ships stand as silent witnesses to what the world took away – the sea, the fish, the birds, the fishermen, their stories and the livelihood of an entire town. The worst part is, all this happened within a generation, within 40 years. Aral Sea used to be 66,000 sq km before 1961 but has shrunk down to just 12,000 sq km (as of Jan, 2010). It was the 4th largest lake after Caspian Sea, Lake Superior and Lake Victoria. On an average, some 25,000 to 2m fish were caught per annum and some 20m fish were canned for export. There were more than 500 ships during its heydays. The marine industry came to stop in 1979. 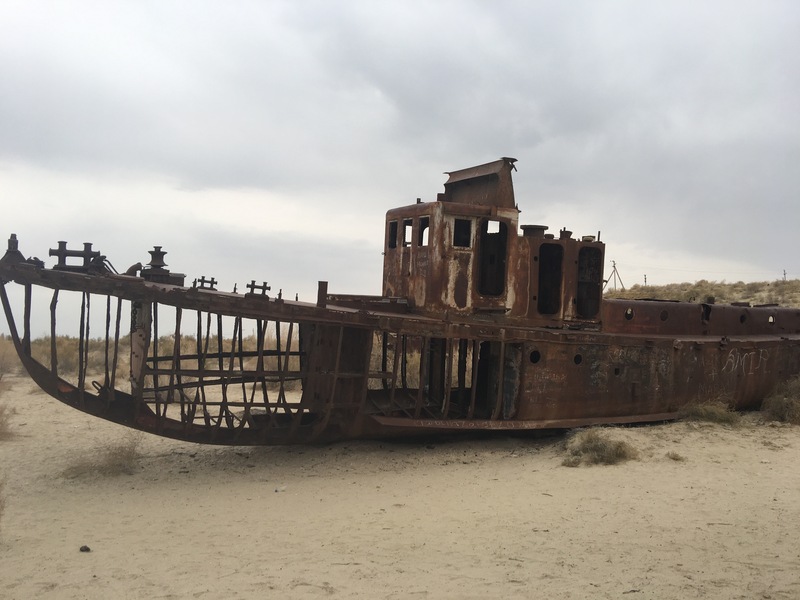 Since 1984, Aral Sea has completely lost its industrial importance and started to close down fish farms and factories. More than 10,000 qualified workers – packers, technicians, freezing works people, quality controllers remained without a job. I saw a lot of cotton fields. Cotton is the pride of Uzbekistan and its cash crop – it even features on its coat of arms. It was to grow the cotton industry and meet the demands of the Soviet Union that Stalin ordered his teams to channel the waters from Amu Darya river away from flowing into Aral Sea to irrigate cotton fields. Amu Darya is one of the main contributors to Aral Sea. The engineering proved to be an ecological catastrophe. Those who could return to their homeland: the Russians, Belarussians, Ukrainians, left years ago. Those who are left behind are those from Karakalpakstan region who are still waiting for the water to return. If the price of cotton is an entire sea, it was a very dear bargain. 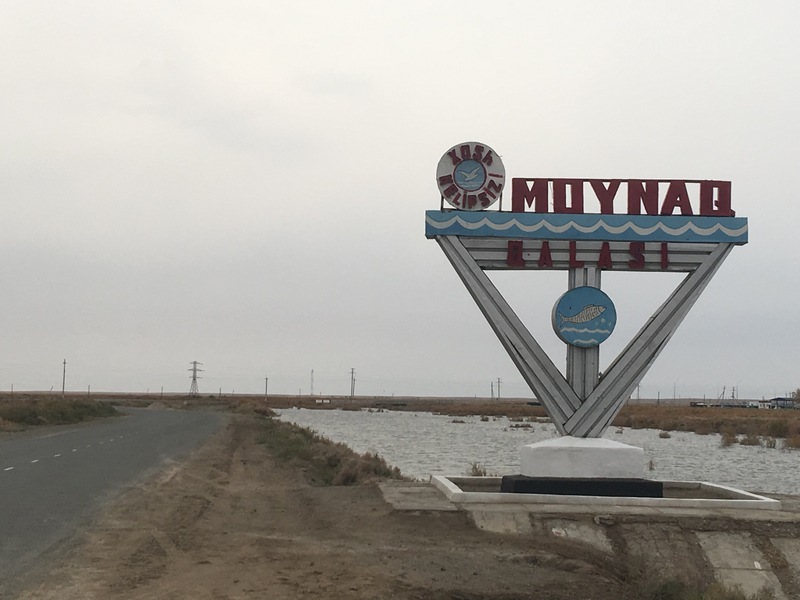 Moynaq is place devoid of any character. Almost similar to the plate of oily boiled potatoes and tea on the side that I had in one of its restaurants. No amount of salt made any difference. It was almost ironic just how much salt there was in the soil and its food was so bland. 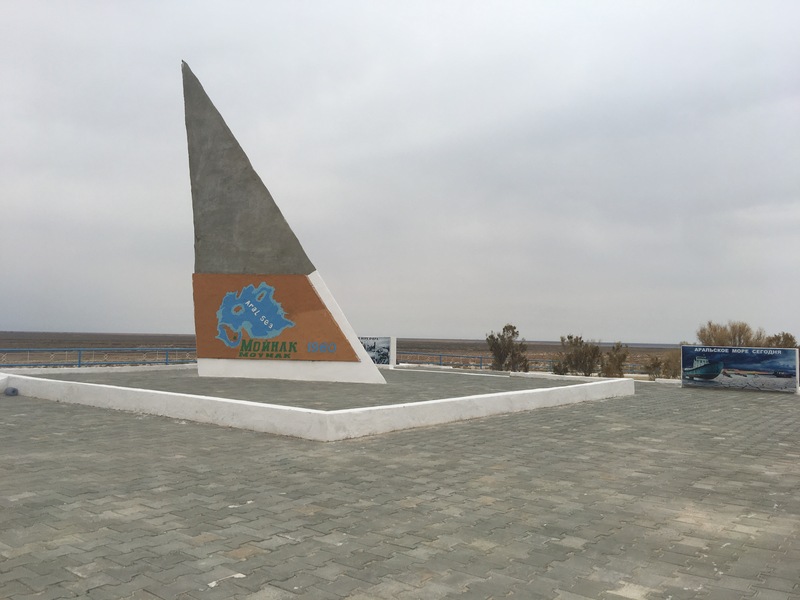 The people in the town appeared to be cut off from the main town of Nukus which is where the airport is located. 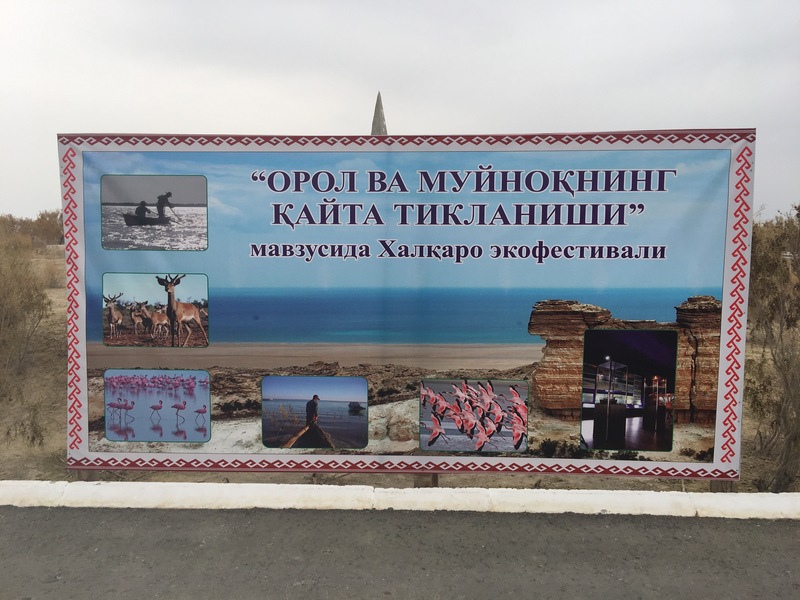 In fact, the entire drive from the airport to Aral Sea and to the hotel was absolutely characterless, yet people toiled in fields and carried on with their lives showing us what the Soviets would have called: Socialistic Realism. No sadness, no futurism, just happy and industrious. You write so well! What a sad state of affairs this area has. That book I mentioned also touches on this subject and the struggles of people here. So depressing. Thanks Anna. I wish I could have stopped to talk to these people. I had watched a documentary by BBC on how miserable the people were after the fishing industry took away their jobs and livelihood. Was it still the same? I wonder. The place looked pretty bleak. It was really quite depressing.